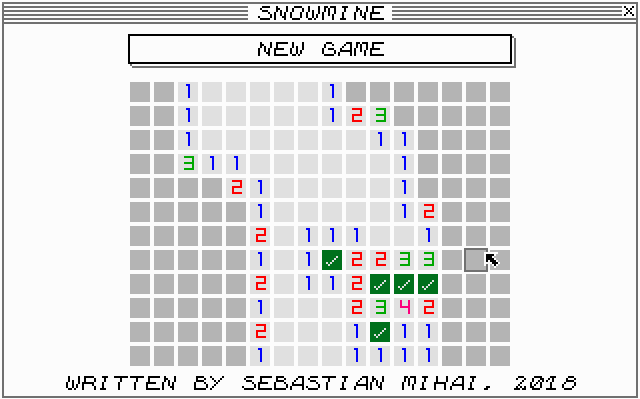 Snowmine is my remake of possibly the most iconic built-in Microsoft Windows game, Minesweeper. Technically, Snowmine is built to rely upon Snowdrop OS's GUI framework, which provides abstractions and UI elements such as buttons, checkboxes, etc. Snowmine is written exclusively in x86 assembly language, like all other Snowdrop OS apps. Snowmine is not distributed stand-alone. Instead, you can find its source code among the other apps included with my homebrew operating system, Snowdrop OS, here.